Code sprint report: June 4, 2011 — mobile UI, venue address exports, venue details, better Plancast import and more! We had a productive code sprint as part of the PDX11 Hackathon. Roy Martin, Daniel Hedlund, Bart Massey, Selena Deckelmann, Leif Warner, William Van Hevelingen, Kirsten Comandich, Dunbar Aitkens, Mary Anne Thygesen, Reid Beels, Audrey Eschright and Igal Koshevoy. Added mobile interface to improve user experience on devices with small screens. The new interface puts the most useful information at the top and makes better use of screen real estate, reflows text for graceful zooming, and hides infrequently-used features behind click-to-expand controls. Improved iCalendar exports and feed to include the venue’s address and Calagator source URL. Updated to Hpricot 0.8.4 library, which should eliminate or reduce segmentation faults, primarily encountered in tests. Fixed missing “bundle exec” references in documentation and webadmin service. Improved documentation to explain the search engine service ports used, which need to be firewalled. Fixed “Cinderella event” handling, so events ending at midnight aren’t shown as part of the next day’s listing. Added per-event venue details field, for describing the room used and other event-specific information. Improved Plancast importer to add machine tags to the event, so that their RSVPs and links are immediately available. Confirmed that all index and show actions can emit XML and JSON for those consuming our data. Fixed test suite to eliminate non-deterministic behavior caused by state leaking between tests. Fixed tests so they don’t access the network and fail. Refactored views that display subnav menus by extracting common logic into helpers. Removed custom geocoder keys in hopes of simplifying setup — only to have to revert these changes because the keys are still needed for displaying maps on anything other than “localhost”. Updated “Code” link in header to point to github. Removed unwanted files that were accidentally checked in. Added a custom iCalendar “prodid” value. Unfortunately, the patch to populate this with Unicode 6.0 glyphs of a crocodile, a calendar, and a happy-snowman-wearing-a-fez were rejected. This decision may need to be reconsidered in the future. Issue 434: Review and merge rical_remodel branch. Issue 443: Recent changes feed should link to both the change log entry and actual entry. Issue 357: Deleting sources should delete their associated events and children. Issue 424: Refresh version shouldn’t throw an exception. Issue 423: Calagator should be able to export events to Google Calendar. Issue 306: Submit patches to acts_as_versioned. Issue 316: Consider adding version number to iCalendar export. Issue 196: Fix acts_as_solr, make it log to a file. Issue 401: JSON should be supported by all controller actions. Issue 436: Solr’s admin port should not be publicly accessible. Issue 447: Import Plancast events. Issue 191: Submit patche to acts-as_solr that make it work. Issue 397: Timezone in settings should be used. Issue 24: Include venue information in iCalendar exports. Issue 339: User should be able to create a new event from an old one. Added Issue 450: Write guide with per-platform installation instructions. Added Issue 451: Add per-item duplicate squasher. Added Issue 452: Add fuzzy venue search. Added Issue 453: Improve the import system. Added Issue 454: Migrate to Ruby on Rails 3. Comments Off on Code sprint report: June 4, 2011 — mobile UI, venue address exports, venue details, better Plancast import and more! We’re pleased to announce a new stable release of the Calagator platform, a well-tested version of the Calagator source code for those that want to run their own instance. This big release was made possible through the generous contributions of many volunteers at the PDX11 Civic Hackathon and various smaller sprints. [!] – Important note regarding some change. [THEME] – Changed theme structure, see the `themes/README.txt` file for details. [SETTING] – Changed setting structure, see the `themes/README.txt`file for details. [SECRETS] – Changed secrets structure, see the `INSTALL.md` file for details. [DEPENDENCY] Added `bundler` for installing dependencies and isolating from unwanted versions of gems. See `INSTALL.md` for usage information. [MIGRATION] Added fields to Venues: access notes, “has public wifi” flag, and “is closed” flag. [THEME] Added file to describe appropriate content for a Calagator instance, e.g. “Portland-area tech events”. If not present, a reasonable default will be displayed. [SETTING] Removed `tz` field. You now only need to set `timezone`. If theme still has `tz`, it will be ignored. Fixed documentation to explain how to create a theme, setup a `development` environment, and install a `production` server. Fixed export to Google Calendar, which could fail if the event’s description was long or truncated at a bad place. Fixed exception notification to send emails with Rails 2.3.10 and newer, submitted fix as patch to `theme_support` plugin maintainer. Fixed exception notification to set `From:` in a helpful way so that these can be replied to by those subscribed to notifications. Fixed previewing of a new event with a new venue, it would throw an exception. Fixed duplicate squashing to not throw exceptions if called with blank arguments, like when hit by a bot. Fixed version refresh system, used on event/venue edit forms, to switch between versions of a record. Added parsers to import Plancast and Meetup events. Added Plancast machine tag to connect Calagator events with their external Plancast counterparts and display Plancast attendees on the event page. Added ePDX machine tag to connect events with their ePDX groups. Added JSON and KML exports to the venues listing. Improved iCalendar importing system to use the better `RiCal` library. Improved venues listing to show the latest and most popular venues, search venues, display map, etc. Improve display of URLs on various pages by truncating them if they’re long. Improved imported sources so they can be deleted and remove their associated event and venue records. Improved recent changes rollback system to display messages, be able to rollback the `create` events, and redirect to appropriate pages. Improved event form to accept URL parameters, so it can be pre-populated with desired values. Improved venue destroy to prevent someone from removing a venue that still has events, to avoid orphaning these. Improved new venue form to accept simplified address and not request longitude/latitude. [!] This version adds support for specifying the search engine to use for local data. The new default is `sql`, which requires no configuration or setup to work. If you have an existing Calagator instance and want to continue using ActsAsSolr, edit your `config/secrets.yml` file and specify `search_engine: acts_as_solr`. See the “Search engine” section of the `INSTALL.md` file for details. [SECRETS] Added `search_engine` field for specifying search engine. [DEPENDENCY] Upgraded to latest stable releases of Ruby on Rails and other libraries. Use `rake gems:install` to install them. [DEPENDENCY] Added optional `sunspot` search engine, which provides the best search results and is more reliable, efficient and speedy than `acts_as_solr`. Fixed importing to support Upcoming’s mobile site, the only one many users can now use. Fixed performance of duplicate checking and squashing interfaces. Fixed exceptions thrown when filtering events by invalid dates. Improved dependencies so production environment doesn’t need testing libraries. Added `sql` search engine, which is used by default and requires no configuration or setup. 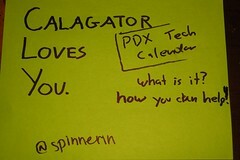 Maybe you already know everything you want to about Calagator. It is pretty easy to use, after all. But perhaps after over two years of it being out in Portland’s tech community (as well as communities around the world), there are a few things you’d like to find out. Post your questions in the comments and we’ll do our best to answer them here on the blog.